Astrophotographer Terry Hancock captured this image from DownUnder Observatory in Fremont, Michigan on Aug. 29 to 31, 2012. 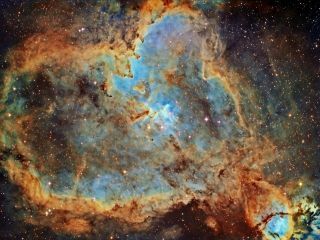 Dubbed the Heart Nebula for its iconic shape, emission nebula IC 1805 glows brightly in this stunning night sky photo. Astrophotographer Terry Hancock captured this image from DownUnder Observatory in Fremont, Mich. between Aug. 29 and 31, 2012. He shot the image over three nights using a cooled monochrome CCD camera (QHY9) mounted on a 3.6" refractor telescope (TMB92SS). "This is a Hubble Palette (HST) version of this beautiful nebula with Sulphur II filter assigned to Red, H-Alpha filter assigned to Green and Oxygen III filter assigned to blue channel," Hancock told SPACE.com in an email. Located about 7,500 light-years away in the constellation of Cassiopeia, the Heart Nebula is a mix of gas and dark dust. Also called IC 1805, this emission nebula was nicknamed for its heart-like shape. In the center of the heart is a newly-formed star cluster called Melotte 15. The image also shows a bright star-forming region called NGC 896. The larger star-forming complex that contains the heart nebula sprawls along the Perseus spiral arm of our home galaxy, the Milky Way.